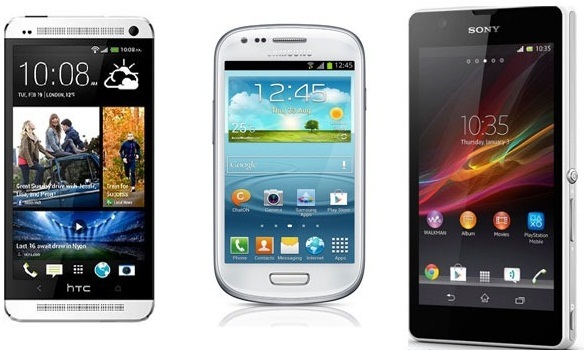 Android Smartphones industry and market is growing day by day and everyday new Android based Smartphones releases from Android Smartphone Manufacturers which includes most popular companies such as, HTC, Samsung, and Sony etc. Today for every popular and hi-tech Android Smartphones has its own Mini Flagships category like HTC One Mini, Samsung Galaxy S4 Mini and Sony Xperia ZR Smartphones which also releases with almost same but little different features and with most compact design and little cheap in cost. 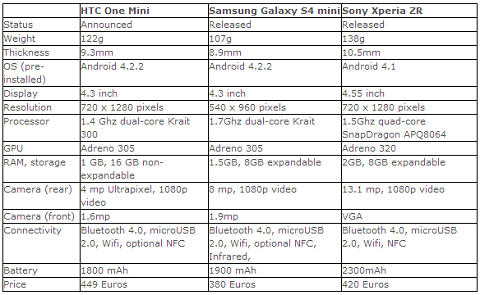 So in this blog-post you will find the Comparison of HTC One Mini, Samsung Galaxy S4 Mini and Sony Xperia ZR Specification and Features in informative Infographic below. We have included the Sony Xperia ZR into Smartphone Mini Flagships category because of its compact design and features and also Sony Xperia ZR is the only smartphone which is dust proof and water resists and other two HTC One Mini and Samsung Galaxy S4 Mini is the genuine and true Android based Mini Flagships Smartphones of its kind. So let's find out more information and details about HTC One Mini, Samsung Galaxy S4 Mini and Sony Xperia ZR Specification and Features in Infographic.